Anyone mind sharing pics of theirs? I am trying to decide how I want to organize DD's closet. We took the doors off DD's closet, painted inside and installed a closet system we got from Lowes. That's your real house and not from a magazine? That is fantastic! I thought it was a magazine too!!! 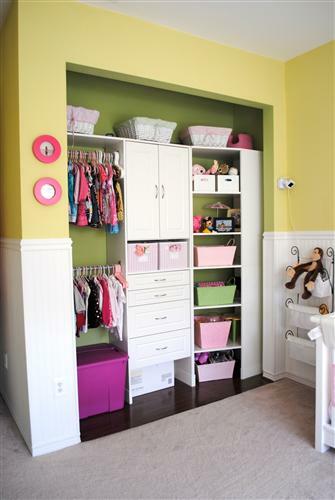 I sooo wish there was a closet in DD room bc I would so do this!!! We just took the doors off the twins future room to do the same thing. What brand is yours? So cute! But why are you all taking the doors off? Camacho- thanks for sharing the pic. Do you by chance know the measurements of the closet? This is very similar to what im envisioning but I think our closet is a little smaller. I also have an armoire so Im thinking I could get away with something very similar but minus the drawers. Thank you! I wasn't sure how I'd like it without the closet doors at first but I love it this way. I'm not sure of the measurements but I can try to measure it for you sometime this week. It's pretty big, but we just went to Lowes with our measurements and chose shelving, cabinets and drawers based on that. Pretty inexpensive and DH installed it.